This study assesses a range of solutions to increase the capacity of the region’s water supply, which may not under all conditions meet unrestricted demands by 2040. The Washington Metropolitan Area Water Supply Alternatives Study provides information on alternatives out to 2085 to help ensure strategic options are available over that planning horizon. Alternatives were evaluated by their abilities to maintain reliability in the face of growing metropolitan area water demand, decreasing river flows due to upstream use, and the potential impacts of climate change. In January 2018, the ICPRB Commissioners adopted a resolution encouraging action on the study results. A feasibility study of potential prerequisites for use of the Travilah Quarry as a raw water supply storage facility. Every five years since 1990, CO-OP has conducted a water demand and resource availability forecast for the Washington, D.C., metropolitan area. 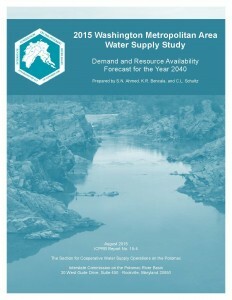 These studies assess whether or not the current water supply system will be able to meet the needs of the region 20 or more years in the future. 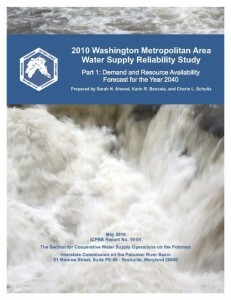 The 2015 iteration of the Washington Metropolitan Area Water Supply Study indicates that by 2035, the current water supply system could experience considerable stress during a severe drought, not accounting for the impacts of climate change. Managing water supply in that event would require mandatory water use restrictions. 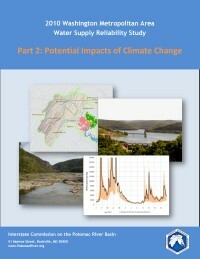 By 2040, in the event of a severe drought, there would be a chance that storage in Little Seneca Reservoir would be depleted and that flow in the Potomac River would drop below the minimum environmental flow level of 100 million gallons per day at Little Falls dam, though only by a small amount. When climate change is considered, a wide range of outcomes is predicted, from the depletion of most reservoirs in the system to there being no issues meeting unrestricted demand. Inability to maintain environmental flow-bys.